During the planning process there was a lot of experimentation involved in setting up the park and the visitor experience. The set-up alone took six months and the final result delivered brilliantly on its “brand promise”. Why was Dismaland so effective? We know from the Peak-End Rule (Fredrickson and Kahneman) that we don’t judge events by the whole experience but by snapshots during the experience. The memory of these snapshots dominates the value of the total experience: it’s the emotional and sensory intensity of the peak moment of an overall experience (plus the feeling experienced at the end) that most influences people. This is the part that so many companies miss. They design customer touchpoints as if they are all equal, giving each one the same level of emotional intensity or worse, no emotional intensity at all. This is what I call being “functionally nice”. The design of the overall experience is important. But it’s the design of the emotionally intense “peak” and “end” touchpoints that are critical to how the customer feels when the experience is over. What is feasible? What can I deliver functionally and technically? What is viable? What can I deliver that meets my goals? For example making a profit or developing a relationship over time. How do I design for the human factors like usability and emotional or sensory effect and intensity? This last point speaks to a deep understanding of human nature – specifically, what your customers will feel at each interaction. It’s therefore critical to understand it from their perspective, not yours. When we help companies understand their customer needs and emotional responses we use observation together with psychological and ethnographic research methods. You can’t just ask people what they want and take their answers at face value: mostly, we humans don’t often know what we want! Human factors are also the ones that are so often neglected. It’s precisely a lack of understanding about the need for emotional intensity that leads businesses to offer mediocre service (or Christmas parks to think that “antlers on an Alsatian dog and spray fake snow on a skip” are acceptable). The experience can’t be all wows and intensity. Many of the touchpoints need to be “functionally nice” and just there to show evidence of good service. These cues can be so subtle that we don’t even consciously think about them, such as the hotel maid folding up the end of the toilet roll to signal that the room has been cleaned and serviced. Other touchpoints, on the other hand, need to be designed for the wow factor of emotional intensity, for the peaks and the end of the experience. 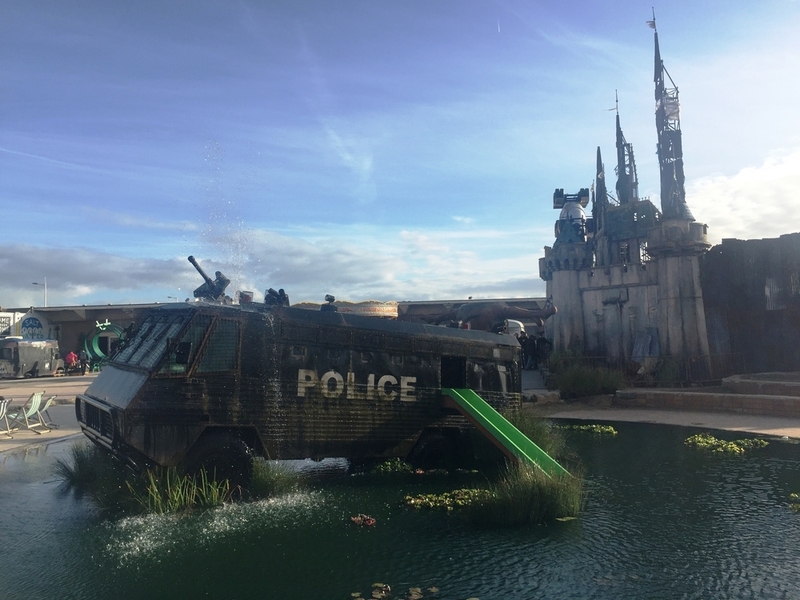 Dismaland delivered on all points with every detail of every interaction meticulously planned, from the frustratingly difficult ticket buying experience to the grim backdrop of Weston-super-Mare. There were very long queues to get in, even with a ticket, then I was met by hostile staff telling me to “have a miserable day”, followed by fake security scanners and by even more hostile “police” with cardboard weapons. The peak experience for me was the very moving Dismaland castle, with its Cinderella crash sculpture surrounded by paparazzi. As an end point, the “exit through the gift shop” was also very memorable, with a strong anti-shopping feel and more belligerent staff telling me to stop taking pictures, get out and don’t come back. 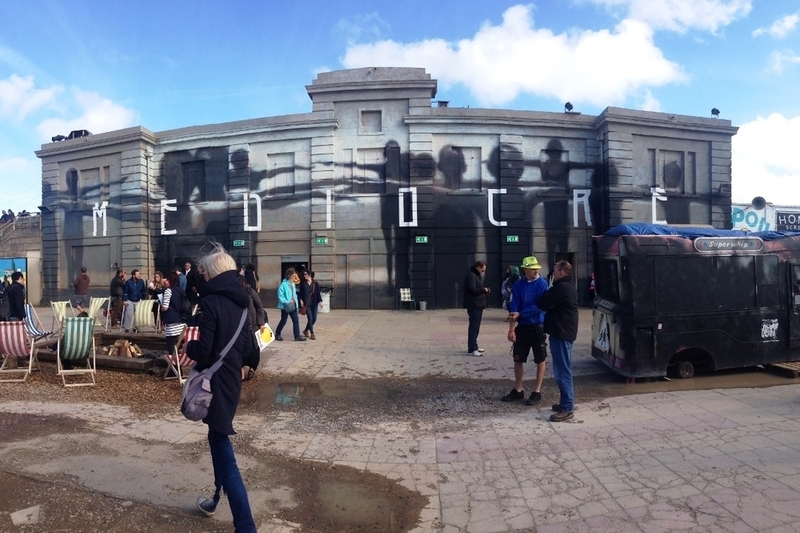 I loved the experience and the messages conveyed but mostly, I loved the way the “service” at Dismaland was designed and planned. If only businesses could be this meticulous in their service design, rather than settling for mediocrity. Do let me know if you have any examples of great service design to share.